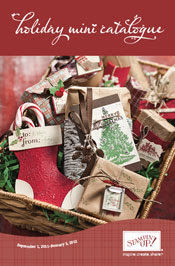 Craftin' Caro: new Holiday Mini Catalogue released! new Holiday Mini Catalogue released! Ahhh... the joy of sharing a new catalogue with you! Stampin' Up! 's new Holiday Mini Catalogue is sure to delight you with all the new and fabulous fall, Thanksgiving, Halloween, Christmas and even Valentine's Day goodies! Want to view in .pdf format? Want to view in Flash? Want to view in more detail through the online store? Christmas Lane Simply Scrappin' Kit...I loved it so much we are basing all 20 of our October Stampin' Palooza projects on it!